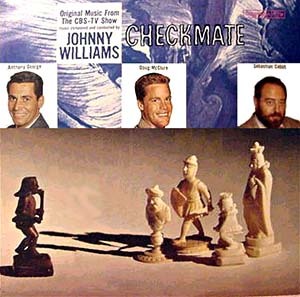 The 439th Soundtrack of the Week is an early effort by the famous John Williams, or Johnny Williams as he was then known: music from the television series Checkmate. I liked this show. It was kind of a private eye show but with the twist that thsi group of investigators attempted to prevent crimes rather than solve them. One of the best things about it was the music. The theme is in 12/8, which the theme from Get Smart is famous for. "The Isolated Pawn" is a tender love theme with some moody elements to it, followed by the briskly swinging "Cyanide Touch". The next two tracks channel Henry Mancini, first in a romantic mood with "Far Outside Place" and then with the toe-tapping "Hassle in the Castle". "En Passant" also sounds a bit like Mancini in lounge mood, and it's hard not to think of Mancini again with the next piece, "The Black Knight". Part of the reason for the similarity might be the shared pool of musicians. Shelly Manne is here, for instance, and did his own record of music from Checkmate. Also on board are Pete Candoli, Jimmy Rowles, Joe Mondragon, Ted Nash et al. Another couple of dreamy tunes, "Fireside Eye" and "Queen's Sacrifice", are next. "Shy Youth" stands out as a sweetly innocent composition on this record. The album wraps things up we have the propulsive and exciting "The King Swings". This early phase of Williams's career isn't especially well known and deserves greater attention than it's received.